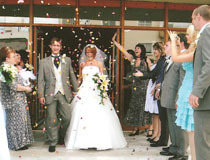 Your wedding can take place at a choice of Town Halls located in (or close to) Cyprus' popular holiday resorts. 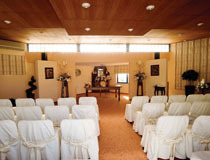 When choosing a civil wedding at a Town Hall, the short ceremony is similar to what we are used to in the UK. 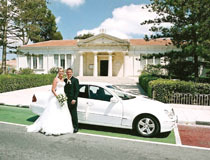 Located in a leafy part of the town, Paphos Town Hall is a smart venue for a civil wedding and we could even arrange for you to travel in style from your hotel in one of the special wedding cars that are available for hire. 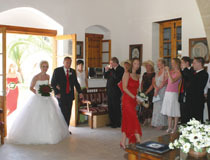 The ceremony takes place inside the Town Hall that offers a choice of two rooms (one for up to 20 persons and another larger one), depending on the number of guests you have. 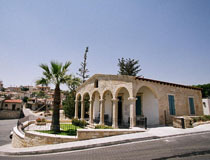 We recommend you stay in any of the hotels we feature in Paphos. The village of Yeroskipou is located less than 10 minutes drive from Paphos, making it a very convenient wedding venue, easily reached from any of the hotels we feature in Paphos as well as in Coral Bay. The ceremony will take place under a huge shaded area that stands outside the picturesque building (no restrictions on the number of guests). 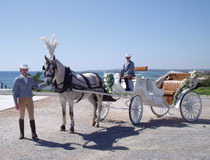 The sand stone walls and steps outside the Town Hall, together with the garden surrounds and sea views in the distance, are all favourite spots for wedding photographs. 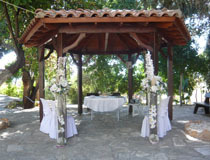 Located 14km from Paphos, Peyia is a popular wedding venue. 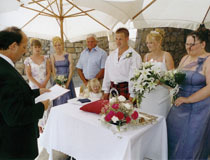 Civil ceremonies take place under the wooden gazebo set in the courtyard of the Town Hall. The old fountain, the stone steps and the garden surrounds enhance this picturesque outdoor setting. To add even more local flavour to your special day, we can arrange for musicians to accompany the bride as she walks towards the gazebo to meet her groom. Crystal waters, golden sandy beaches, the first sunrise in Europe, gorgeous sunsets... Paralimni holds all the ingredients for a very romantic start to your married life. To enhance the idyllic setting, Paralimni Town Hall has also created a beautiful wedding room that can accommodate up to 100 persons. White covered chairs, a white carpet, white decor and flower arrangements will perfectly complement your very special day. We recommend you stay in any of the hotels we feature in Protaras area. 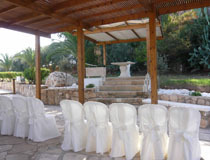 This new wedding venue in Protaras means that we can now offer couples the chance to enjoy a civil ceremony outdoors. 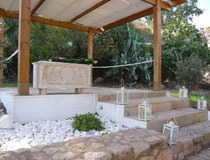 St Elias Garden Venue comes complete with a shaded area and stands amidst lush grounds just below the famous and very pretty church that dominates the area - a picturesque setting for photographs. 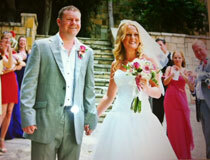 Blessed with the most beautiful white sandy beaches, Ayia Napa is a excellent location for weddings and honeymoons. 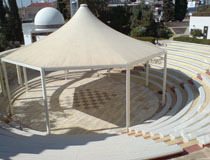 And if you have chosen this vibrant resort as the venue for your civil wedding, the ceremony can take place inside the town hall or outside under a gazebo set at the amphitheatre. Whichever location you choose, we will tailor-made your day to meet your wishes. We recommend you stay in any of the hotels we feature in Ayia Napa. 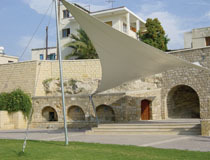 Yermasoyia is situated east of Limassol and its town hall is at the Cultural Centre, an old stone building that has been renovated with much care and attention to detail. 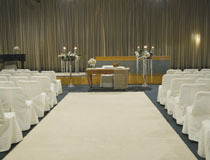 Here, wedding ceremonies are conducted in a smart room with its walls decorated with framed samples of traditional lace. 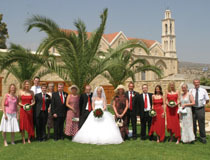 The gardens with the church of St Paraskevi in the background make a perfect setting for your wedding photographs. 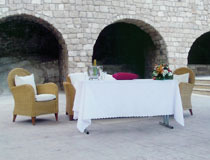 We recommend you stay in any of the hotels we feature in Limassol. 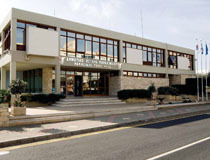 Located a short drive from the centre of Limassol, Agios Athanasios Town Hall is one of our newest venues in the area. The building is about 100 years old and used to be a school. 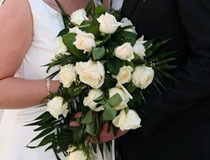 Fully renovated following traditional standards, it is now a very charming venue for a wedding ceremony within easy reach of all our accommodation in Limassol.